Dr. Audrey Dussutour is a National Center for Scientific Research (CNRS) Scientist at Paul Sabatier University in Toulouse, France. Audrey received a Masters Degrees in Ecology from Paul Sabatier University, a Masters Degree in Neurosciences and Ethology from the Free University of Brussels in Belgium, and a PhD in Animal Behavior working in laboratories from both of these universities. She next conducted postdoctoral research at Concordia University in Canada and at the University of Sydney in Australia. Audrey has received numerous awards and honors for her exceptional work, including the Adolphe Wetrems Award of the Belgian Royal Academy, the Young Investigator Award of the French Society for the Study of Animal Behavior, the Outstanding Paper Prize from the Journal of Experimental Biology, Lauréate du Prix Le Monde de la Recherche, and the Young Researcher Prize from the French Society for the Study of Animal Behavior. Audrey joined us for an interview to talk about her experiences in life and science. When she’s not in front of her computer screen for work, Audrey loves going out to the movies and watching DVDs from her extensive collection. Some of her favorite directors are John Cassavetes and David Lynch, and she gets into sci-fi films as well. Audrey studies animal behavior and collective intelligence in ant colonies and slime molds. In ant colonies, she examines how the ants regulate traffic to avoid traffic jams. By observing how they behave, she can create algorithms that may help alleviate our own traffic jams. In slime molds, Audrey investigates the different cognitive abilities they are able to display even though they don’t have brains. Her interest in science started early during her childhood. Audrey initially wanted to become an astrophysicist, then a veterinarian, and in college she discovered the field of animal behavior research. The first experiments Audrey worked on as a college student were in the field of neuroscience using mouse models, but she quickly realized this area of research was not for her. While a master’s student, Audrey worked in ecology studying honey bee behavior, but her allergy to bee stings cut her honey bee research career short. Once she was introduced to the field of ant behavior research, she loved it. This line of research still continues in her lab today. When Audrey conducted an experiment examining the link between nutrition and longevity in ants, she ran into an unexpected complication. She chose a species of ants that was supposed to live for about two months, and she started with about 10,000 ants. Different nests were fed different diets, and she tracked them over time to see which diets allowed the ants to live the longest. This involved going in to the lab each day to monitor how much the ants were eating and how many were still alive. At two months, most of the ants were still alive. The project continued for a full year and a half before the very last ant in the experiment died. This meant, Audrey worked in the lab every single day for a year and a half, skipping all holidays and weekends. The last ant standing lived for ten days longer than all the others, and Audrey even began to have dreams about the day the ant would die and the experiment would be over. After confirming their findings in a separate species of ants, Audrey and her lab retired from research on longevity. Among Audrey’s many successes, she highlighted the first scientific paper she ever published. This was written on her master’s degree research project, and it was published in the prestigious journal Nature. Another major success occurred during her postdoctoral fellowship in Australia when she established that ant colonies use collective nutrition. Audrey demonstrated that foragers adjust the types of food they bring back based on the needs of the colony, and that digestion is a collective task in which certain types of food are pre-digested by larva before being consumed by adult ants. The third big success she mentioned was being the first person to ever record learning in a unicellular organism. 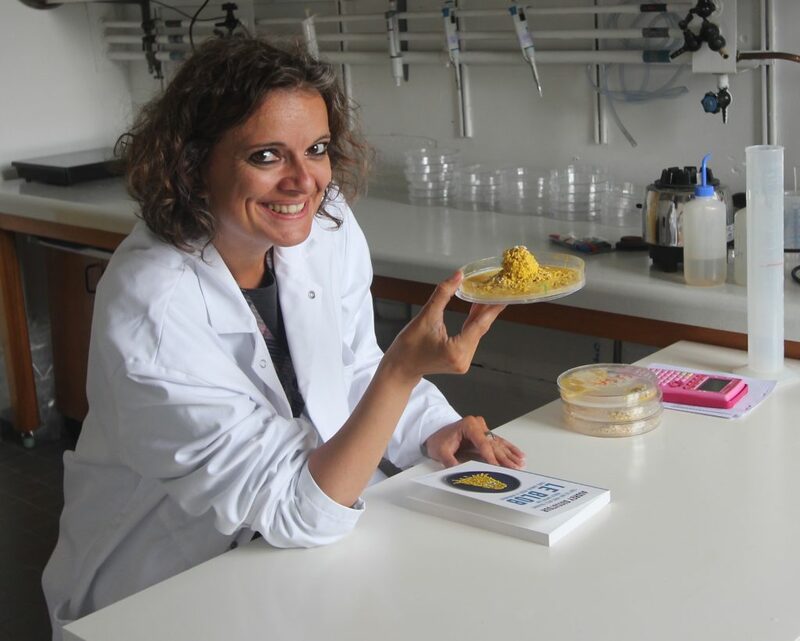 Using slime mold, Audrey demonstrated that a single individual slime mold can learn, and this knowledge can be transferred to other slime mold individuals. This exciting success led to her being invited to write a book that has been very well-received in France. Australia was Audrey’s favorite place she has traveled to for science. She spent three years there as a postdoctoral fellow, and the wildlife was completely different from what she was used to in Europe. Each weekend felt like a holiday since Audrey was able to visit some of the phenomenal national parks, experience the beautiful beaches and snorkeling sites, and check out the famous Blue Gum Forest in the Blue Mountains. In downtown Sydney, there were many fantastic pubs, and the Sydney Opera House was amazing. Audrey’s colleagues like to bet about things when there is a disagreement. However, instead of betting money, they bet tacky, small gnome statues. If you lose a bet, you receive a gnome that must be kept on display in your office. The winner of the bet gets to choose the gnome statue, and they are often funny or embarrassing. Everyone has at least one gnome, but there is one scientist she works with whose office is full of gnomes from losing bets. If you need statistics to tell if there is a difference in your data, there isn’t a difference. When you replicate your data many times, and the results persist, then statistics aren’t necessarily required to confirm there is a difference. On the other hand, it can be misleading to interpret an imperceptibly small statistical difference with a p value of 0.045 as meaningful. If you want to do science, you have to think about science becoming your life. You don’t have to be the best student in your class though. The most passionate people are the ones who succeed in science. Within Ethology, Audrey is working in the exciting field of collective behavior and swarm intelligence. Her expertise comes from a variety of fields such as mathematics, computer science, neurobiology, cell biology, and animal behavior. Most recently, Audrey’s work has focused on the origin of cognition using slime molds. She has discovered that non-neural organism are capable of learning, redefining the notion of intelligence. In France, Audrey is actively involved in public outreach through conferences, school visits, documentaries, and radio shows. Outside of work, Audrey has a strong passion for movies, she possesses a collection of thousand DVDs, enjoying some blockbusters as much as independent cinema. She shares this passion with her musician husband in down town Toulouse also called the “pink city”.